Hopkins' Hoppin' Happenings: Bucket Filling Freebie! Those of you who follow me know how much I preach about being kind to others. We should do what we can to make others feel good and teach that to our students. That can be as simple as smiling, opening a door for someone, giving a hi five or giving someone a hug. As many of you know I'm a huge fan of the books "Have You Filled A Bucket Today" by Carol McCloud and "How Full Is Your Bucket for Kids" by Tom Rath. You search bucket filling to find my previous posts on the topic. Today, I would like to share a freebie that I made to go with the book. It is a word sort on bucket filling and bucket dipper. Do you use the bucket filling system in your classroom? How do you use it? Stop by tomorrow for another freebie. Thanks for hoppin' by Hopkins' Hoppin' Happenings. Keep on smiling! Hi Brian, I use the bucket filling system in my classroom. Each student has a bucket and when they observe their peers doing something nice they put a pomp pomp in said student's bucket. Once a student's bucket is filled I place a sticker on their bucket. My students love being bucket fillers. 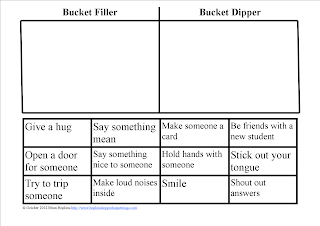 If they notice bucket dippers , they explain to their classmates how to become a bucket filler. I love this system. Angi, I am so pleased to hear that it is working for your class. That is so awesome that they do such a good job of explaining how to be a bucket filler instead of a bucket dipper. I love the activity you do with them! This is great! I am just about to start bucket filling in my class, so I appreciate the resources. Awesome Becky! I hope it helps the children spread kindness to everyone! Hi Brian, Thanks for this resource. I read the book to my class today and they listened intentively. We went around in the circle giving a compliment to everyone. Tomorrow I will do your activity and decorate our buckets (cups) only 3 weeks of school left (New Zealand, we finish for the summer) and do Angi's activity too. You're so welcome! I'm glad to hear that you read the book and listened to it. I hope your students enjoy my activity. That is so awesome that you'll be on summer break soon! I love that I have so many readers from all over the world! Have a great end of the year and a great summer!